To achieve the best results, you need to track your nutrition and training. We’ve made that easy by incorporating automatic trackers for activity, progress, commitment rate, calories and macronutrients. Since nutrition and training go hand in hand, you need to track them both at the same time to get an accurate picture. If you’re struggling to lose weight or add lean muscle, turn your attention to what you’re eating, and how much you’re eating. If you’re consuming too many calories, you’ll gain weight; if you’re not consuming enough, you’ll lose weight. Finally, commitment rate to your training is important also as you could have the best program in the world, but if you’re only doing half your workouts you won’t ever see results. Our Calorie and macronutrient tracker keeps track of what you’ve eaten and presents it graphically so you can easily see your progress for the day. Our calorie tracker is based off your resting metabolic rate, and is adjusted to your activity level based on your desired goal and exercise habits. Both the pre-designed meal plans, and the customized meal plans automatically track your calories and macronutrients as you consume each meal. This makes tracking easy so you can focus on what’s important, instead of counting your calories manually. 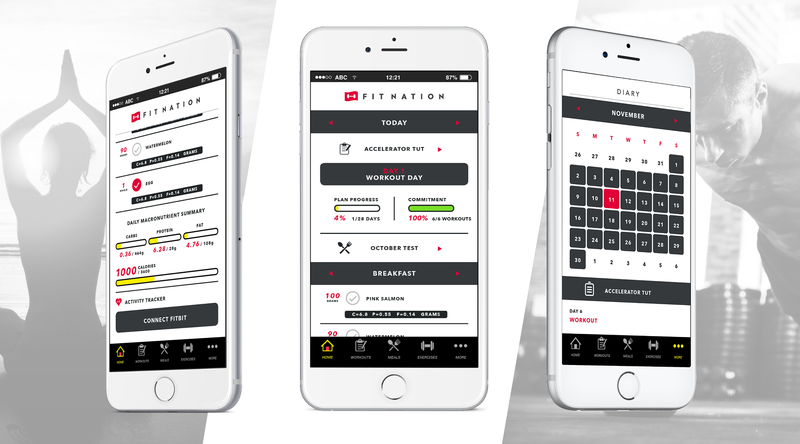 FitNation workout trackers automatically track how compliant you are with your program, and what percentage of your workouts you complete making it easy to monitor your progress. Not tracking your workouts is one of the biggest training sins you can commit. If you are constantly tracking, you keep yourself accountable and motivated in those times where you really don’t feel like training. FitNation synchronizes with FitBit activity trackers and displays your activity in easy to read graphs to help you track how many calories you’ve burned throughout the day. This makes it even easier to see how your daily calories really stack up.